It is amazing to work on the web. We have a huge gift in the form of a decentralized network of devices. A network that helps people around the world to communicate and learn. And a huge resource of entertainment on demand. A gift we can tweak to our needs and interests rather than unwrap and consume. Some of us even know the technologies involved in creating interfaces of the web. Interfaces that empower others to consume content and become creators. And yet there is a common feeling of failure. The web seems to be never good enough. Despite all our efforts the web doesn’t feel like a professional software platform. Our efforts to standardise the web to allow becoming a “web developer” easier seem not to work out. We keep re-defining what that even is. Lately a lot of conferences have talks about mental health. Talks about us working too much and not going anywhere. Talks about how fragmented, insecure and unprofessional our tech stack is. There is some truth to that. We worked for almost two decades on the web and the current state of it isn’t too encouraging. The average web site is too big to consume on mobile devices and too annoying to do so on laptops. We limit things too much on mobile. We cram a proverbial kitchen sink of features, code and intrusive advertising into our desktop solutions. Let’s see what’s going on there and how we can shift ourselves away from this Tetris mindset. I’ll start by zooming out and talk a bit about the way we communicate about technologies. 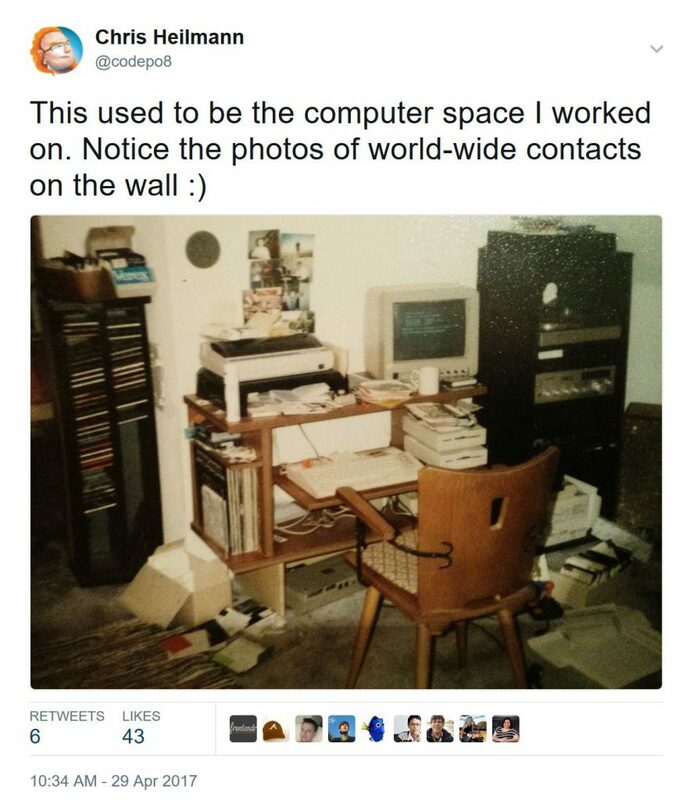 One of my older tweets – This was my old computer setup. Notice the photos of contacts on the wall. When I started using computers my setup was basic by current standards. And yet I didn’t use the computer to play. I wanted to use it to communicate. That’s why I reached out to other creators and makers and we shared the things we wrote. We shared tools that made our life easier. We got to know each other writing long notes and explanations. We communicated by mail, sending floppy disks to each other. Once we got to know each other better, we shared photos and visited each other in person. It was a human way to create. Communication came at a high price and you had to put a lot of effort into it. Which is why we ensured that it was high quality, cordial communication. You had to wait weeks for an answer. You made sure that you said everything you wanted to say before you created the package and mailed it. Fast forward to now. Communication is a dime a dozen. We’re connected all the time. Instead of spending time and effort to get to know others and explain and lead, we shout. We aim to be the most prolific communicator out there. Or to prove someone wrong who is loud and prolific. Or make fun of everything others spent a lot of effort on. The immediacy and the ubiquity of communication is cheapening the way we act. We don’t feel like putting up much effort upfront. A stream of information gives you the impression that it is easy to undo a mistake right after you made it. But the constant barrage of information makes others in the conversation tune out. They only prick up their ears when something seems to be out of the ordinary. And this is where polarisation comes in. A drive to impress the audience in a positive way leads to unhealthy competitiveness. Giving out strong negative messages leads to witch hunts and Twitter drama. The systems we use have competition built in. They drive us having to win and release the most amazing things all the time. Gamification is what social networks are about. You get likes and views and retweets and favorites. Writing more and interacting more gets you to a higher level of access and features. You’re encouraged to communicate using in-built features like emoji, GIFs and memes. It is not about accumulating sensible content and finding solutions. It is about keeping the conversations and arguments going. All to get more clicks, views and interactions to show us more ads – the simple way to monetise on the web. What this model brings is drama and dogma. The more outrageous your views, the more interaction you cause. The more dogmatic your approach, the more ammunition you have proving others wrong. It is not about finding consensus, it is about winning. Winning meaningless internet points and burning quite a few bridges whilst you do it. And it is addictive. The more you do it, the higher the rush to win. And the more devastating the feeling of non-accomplishment when you don’t win. Let’s zoom in again into what we do as web developers. Web development is a spectrum of approaches. I’ll try to explain this using Tetronimos (that’s the official name of Tetris blocks). On the one end we have a conservative group that doesn’t trust any browser or device and keeps it all on the server. On the other we have people who want to run everything on the client and replace web standards with their own abstractions. Conservatives allow the user to customise their device and environment to their needs. The other extreme is OK to block users who don’t fulfil certain criteria. The following are not quotes by me. I encountered them over the years, anonymised and edited them for brevity. Let’s start. This is a group of people that most likely have been around the web for a long time. They’ve had a lot of promises and seen new technology proving too flaky to use over and over again. People that remember a web where we had to support terrible environments. A web where browsers were dumb renderers without any developer tools. You can’t trust the client, but you can trust your server. Web standards are good, but let’s not get overboard with fancy things. This approach results in bullet-proof, working interfaces. Interfaces that are likely to bore end users. It seems clumsy these days to have to re-load a page on every interaction. And it is downright frustrating on a mobile connection. Mobile devices offer a lof of web browsing features using client-side technologies. What’s even worse is that this approach doesn’t reward end users who keep their environment up to date. These people are more excited about the opportunities client-side functionality give you. But they tread carefully. They don’t want to break the web or lock out end users based on their abilities or technical setup. Progressive enhancement is the way to build working solutions. You build on static HTML generated from a backend and you will never break the user experience. You have no right to block any user. The web is independent of device and ability. It is our job to make sure people can use our products. We do that by relying on standards. Web products do not have to look and work the same in every environment. Working, great looking interfaces that vary with the environment. This is the best of both worlds. But it also means that you need to test and understand limits of older environments. Browser makers learned a lot from this group. It wanted to make the web work and get more control over what browsers do. That helps standard bodies a lot. This is the group most concerned about the HTML we create. They are the people advocating for semantic HTML and sensible structures. No matter what you do, HTML is always the thing the browser gets. HTML is fault tolerant and will work wherever and forever. Using semantic HTML gives you a lot of things for free. Accessibility, caching, fast rendering. You can’t lose. HTML is the final truth, that’s 100% correct. But we dropped the ball when HTML5 leap-frogged innovation. Advanced form interactions aren’t as reliable as we want them to be. Adding ARIA attributes to HTML elements isn’t a silver bullet to make them accessible. Browser makers should have spent more time fixing this. But instead, we competed with each other trying to be the most innovative browser. When it comes to basic HTML support, there was hardly any demand from developers to improve. HTML is boring to most developers and browsers are forgiving. This is why we drown in DIVs and SPANs. We keep having to remind people of the benefits of using real buttons, anchors and headings. This is a group advocating for a web that allows developers to achieve more by writing less code. They don’t want to have to worry about browser differences. They use libraries, polyfills and frameworks. These give us functionality not yet supported in browsers today. Browser differences are annoying and shouldn’t be in the way of the developer. That’s why we need abstraction libraries to fix these issues. Understanding standards while they are in the making is nothing we have time for. $library is so much easier – why don’t we add it to browsers? I don’t want to have to think about older browsers and broken environments. Frameworks and build processes can take care of that. The concept of starting with a text editor and static files doesn’t exist any more. We have so much more benefits from using a proper toolchain. If that’s too hard for you, then you’re not a web developer. It is a waste of time to know about browser differences and broken implementations. It is much more efficient to start with an abstraction. Developer convenience trumps end users experience here. This can result in bloated solutions. We know about that bloat and we create a lot of technologies to fix that issue. Browser makers can’t help much here. Except creating developer tools that connect the abstraction with the final output (sourcemaps). These are the bleeding edge developers. They want to re-invent what browsers and standards do as they’re not fast enough. Browsers and web standards are too slow and don’t give us enough control. We want to know what’s going on and control every part of the interface. CSS is broken. The DOM is broken. We have the technologies in our evergreen browsers to fix all that reliably as we have insight into what’s happening and can optimise it. This approach yields high fidelity, beautiful and responsive interfaces. Interfaces that lock out a large group of users as they demand a lot from the device they run on. We assume that everybody has access to a high end environment and we don’t cater to others. Any environment with a high level of control also comes with high responsibility. If you replace web technologies with your own, you are responsible for everything – including maintenance. Browser makers can take these new ideas and standardise them. The danger is that they will never get used once we have them. The more innovative you are, the more you have to be responsible for the interface working for everybody. The more conservative you are, the more you have to trust the browser to do the right thing. Every single group in this spectrum have their place on the web. In their frame of reference, each result in better experiences for our users. The difference is responsibility and support. The less we rely on browsers and devices, the more we allow end users to customise the interface to their needs. Our products run everywhere. But are they also delivering an enjoyable experience? If I have a high-end device with an up-to-date, evergreen browser I don’t want a interface that was hot in 1998.
Who defines what and who is in charge? Who defines who is allowed to use our products? Who has the final say how an interface looks and what it is used for? If our users are the end goal, findings and best practices should go both ways. Advocates of a sturdy web can learn from innovators and vice versa. We’re not quite doing that. Instead we build silos. Each of the approaches has dedicated conferences, blogs, slack channels and communities. Often our argumentation why one or the other is better means discrediting the other one. This is not helpful in the long run. This is in part based on the developer mindset. We seem to be hard-wired to fix problems, as fast as possible, and with a technological approach. Often this means that we fix some smaller issue and cause a much larger problem. How great is the web for developers these days? It is time to understand that we work in a creative, fast moving space that is in constant flux. It is a mess, but mess can be fun and working in a creative space needs a certain attitude. Instead of trying to fix all the small niggles, let’s celebrate how far we’ve come with the standards and technologies we use. We have solid foundations. Progressive Web Apps: The concept of Progressive Web Apps is an amazing opportunity. By creating a manifest file we can define that what we built is an app and not a site. That way User Agents and Search Engines can offer install interfaces. And browsers can allow for access to device and Operating System functionality. Service Workers offer offline functionality and work around the problem of unreliable connectivity. They also allow us to convert content on the fly before loading and showing the document. Notifications can make our content stickier without even having to show the apps. Tooling: Our developers tools have also gone leaps and bounds. Every browser is also a debugging environment. We haveh ackable editors written in web technologies. Toolchains allow us to produce what we need when it makes sense. No more sending code to environments that don’t even know how to execute it. Information availability: Staying up up-to-date is also simple these days. 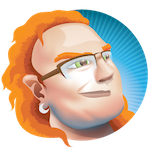 Browser makers are available for feedback and information. We have collaboration tools by the truckload. We have more events than we can count and almost all publish videos of their talks. It is time for us to fill the gaps. It is time we realise that not everything we do has to last forever and needs to add up to a perfect solution. It is OK for our accomplishments to vanish. It is not OK for them to become landfill of the web. Our job right now is to create interfaces that are simple, human and fun to use. There is no such thing as a perfect user – we need to think inclusive. It isn’t about allowing access but about avoiding barriers. We have come a long way. We made the world much smaller and more connected. Let’s stop fussing over minor details, and show more love to the web, love to the craft and much more respect for another. Things are looking up, and I can’t wait to see what we – together – will come up with next. You don’t owe the world perfection, but you have a voice that should be heard and your input matters. Get creative – no creativity is a waste.